… “then I look at you and the world is alright with me, just one look at you and then I know it’s gonna be a lovely day”. I’m talking off course about Cava. But not any Cava, the on my mind today is a new friend and it’s going to be walking by my side for a long time to come. Can not imagine any better way to spend the day than to do it with genuine people with a absolute love for good Cava and food. Happy as ever that I got invited, and provided with the opportunity, to try some of the very best that Catalonia has to offer, people, laughter and Cava! To spend the day with a new acquaintance and his family, is in my book, invaluable and very inspiring. Both when it comes to sharing the wine/Cava experiences, but also the discussions that came up, a mix of food, drinks & travel, politics, languages, Cava and of course football, unfortunately Barcelona FC lost today, so that part of the talks was short. Pere Canals with his lovely wife Àngels and their two sons greeted us like old friends and as a part of the family, when we today spent the day with them in their country side cottage. What came to mind several times was the fact that not once did any of them mention their Cavas, winery or give the usual sales pitch. It was just so very genuine! Sure, we tasted their range of Cavas and we did talk about them, but you know what I mean, not in the salesman way. This did not go unnoticed! This is my kind of setting! Pere did get to express that his favorite is the Castell Sant Antoni Gran Reserva as it “Could be the picture of Sant Antoni”! 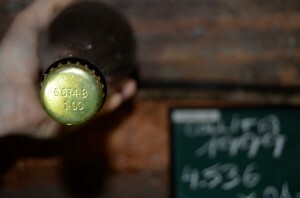 The lower number on the cap indicates that the Cava resting sur lees, has been closed since January 2000! 14 Years! Pere and I got in touch thanks to FB and some mutual friends. 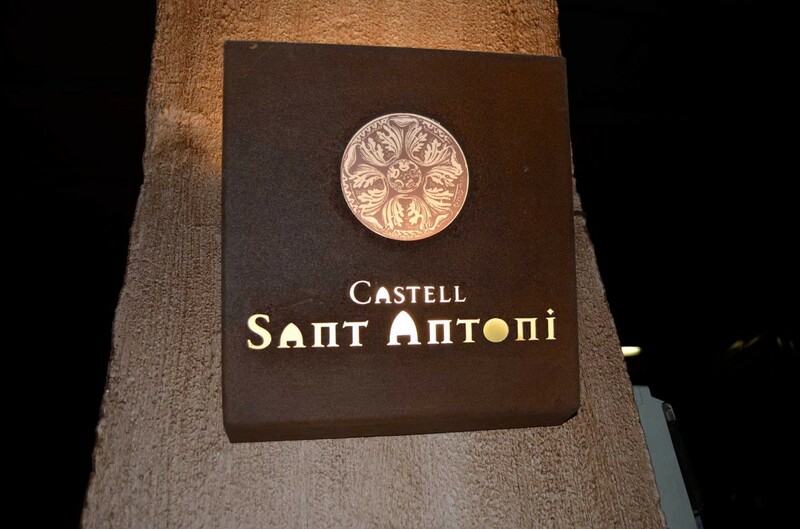 Knowing that Castell Sant Antoni is a small producer, I knew that sooner or later a visit had to take place. Said and done, a short text message to Pere, an answer a couple of minutes later and only a few days passed and we came, we saw, we tasted. Over some lovely tapas, prepared by Àngels, the time past all to fast, but the memories of this day is embedded in my mind for a long time to come, and coming back I certainly will be, if they’ll have me! If there is only one word to choose to describe Pere, it would have to be meticulous. Why? A man that thinks long term, that invests in knowledge and innovation and doesn’t stray from the set path, showing great attention to detail, being very careful and precise, is by definition meticulous. 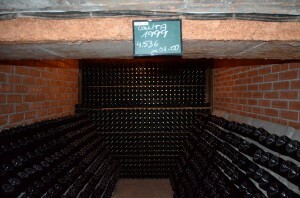 Cava has been produced by some of the cellars in Sant Sadurni for 100 years. So imagine, one day having the thought that you want to compete and not only that, but to churn out Cavas that are different and superior to the existing ones, such enterprises takes guts! Only in 1999 the current setup was introduced. The decision to do it that year was a smart business move, that had been softly boiling for 7 years, during which time Pere acquired knowledge and experience, which he would later need and put into action. The millennium was changing soon, and which year throughout history has been the all time best seller? That’s right, 1999! Think, act and thou shall be rewarded, without the plan there will be nothing. In average, if you think of setting up your own wine making business, you’ll have to give it at least 5 years without breaking close to even, and then some. After 15 years the accolades are growing by the day and what could have been perceived as a failed investment at the time, is now starting to pay off. 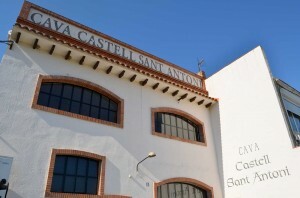 Sant Antoni winery now supplies 15 countries in the world with their Cava. Considering the size, the smallest in the region, with only around 80.000 bottles produced, that is quite the feat. 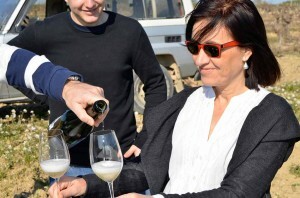 Denmark and Sweden are the two newest import markets, a fact that makes me very happy as wine lovers in these countries will get to enjoy a fantastic Cava and not only the bulk produced run of the mill. 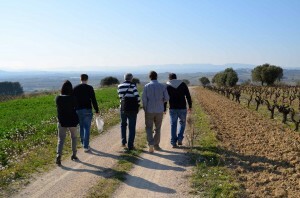 The Canals family and a friend, with a view to a kill amongst the vineyards! After a introductory tour of the winery and cellars, talks of the path towards perfection, we slowly set of to another path. Cami Del Sot. Cami is the Catalan word for small road/path, and in this case it leads to the vineyard El Sot, where the family also have their retreat in the shape of a lovely cottage, with amazing views. Wonderful old vines of Parellada (60 years old) and younger Xarel.lo and Macabeu surround the small house overlooking Sant Sadurni. This is also the planned location for the future growth of the company. 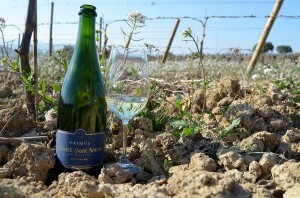 Today, the vintner Josep and Peres older son Sergi had to prune and tie up the 3-year old Xarel.lo plants, so a bottle of the Primvs Brut Nature was opened to be enjoyed in the vineyards with the rays of the March sun shinning down on us and the land. Coming back to its rots. This is their youngest Cava, with a mere 24 months sur lees, but the body and power of a aged sibling. Nice fruit, honey and slight touch of pastries. A yummy day to day Cava! The Gran Reserva 2006, with 15% Chardonnay and the holy trinity (Macabeu, Xarel.lo and Parellada) comprising the rest, was enjoyed as well as my favorite for the day, the 2006 Gran Barrica with 33% Chardonnay (which has been barrel fremented 4 months). Golden color with soft bright reflections, clean, good and fine bubbles, slow rising. The nose gives off intense aromas highlighting a multitude of pastries, brioche, toast, creamy with white fruit and a slight citrus presence, nuts appear along the way. Secondary gave orange peel and slightly bitter nutty overtones. The acidity is not overwhelming, but rather well equilibrated. Creamy entry, candied sugar, toffee. Broad and vivid, long aftertaste of candied fruit with notes of nuts. This is a a true vintage Cava, only released in 1999, 2003 and 2005. 4.000 – 5.000 Bottles unleashed. The 2003 vintage was a year with hot and dry climate, with a difficult harvest, giving low volume.